Rubber Fenders D Shaped in various sizes as per customer required and application. Completely manufactured as per IS Standards. We bring forth our vast industrial experience and expertise in this business, indulged in providing Dock Fender. This Dock Fender is highly appreciated amongst customers for its smooth finish and exceptional strength. Our product range is designed as per the set industrial norms and standards. dipti dda series d type fenders are commonly used on tugs, vessels, boats ect. These fenders are also used for extensive application on small jetties and fishery harbours too. They are compression moulded with steel inserts if required. 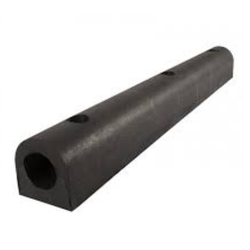 We are offering a wide range of Dock Rubber Fender. We are offering Extruded Dock Fenders to our client. D type fenders made of special grade EPDM are used for tugs, barges, work boats and pilot boats as side belting and protective fenders against heavy rubbing, brushing forms. These D type fenders display a higher energy absorption capacity, thus minimizing deface contact. Fenders of d-type display a higher energy absorption capacity. They can be mounted on quay wall by means of anchor bolts. "hippo" D type fenders are used for tugs, barges, workboats and pilot boats as side belting and protective fenders against heavy rubbing, brushing forms. These D type fenders display a higher energy absorption capacity, thus minimizing deface contact. These fenders can also be mounted on quay are by means of anchor belts.